Click the gallery images for larger versions. Click the camera-arrow icon to see where the photo was taken on the layout. Image 3-1. Preliminary view of Freytag Steel Mill, now under construction. The two Huletts were built by Garry Lance. 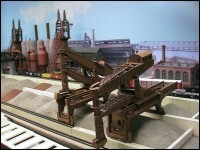 Hopefully they will one day be operating, along with the bridge crane for the ore pit. See the skip hoist in action. Scroll down for more images of the mill. Image 3-2. Flood loader at Sparwood open pit coal mine. Image 3-3. A wheel excavator to remove overburden is rarely used in North America, but this particularly large coal seam covered by virtually rock-free soil makes its use feasible and economical in this part of Sparwood Mining. The model is a modified 1:200 Renwal kit. It has been redesigned to crawl, rotate, raise and lower the excavator boom, and actually excavate the model overburden (which is removed by a conveyor belt) all by remote control. Image 3-4. Business end of the wheel excavator. Note the operators in the control cabin. See the wheel excavator in action. Image 3-5. Three hot metal cars stand idle in front of the industrial green electric arc melt furnace building and its baghouse, and an open hearth furnace building. Image 3-6. A lone BN Geep is hauling auto racks from the Ford Motor plant, with Freytag Steel open hearth furnace in the background. Image 3-7. The electric arc melt furnace produces steel from iron and scrap steel. The massive rust-colored pipes lead to the bag house which catches what would otherwise pollute the air. Image 3-8. An old mill building is sandwiched between the electric melt furnace building and the soaking pit building of Freytag Steel. Image 3-9. The Freytag Steel soaking pit building is still relatively new-looking. Image 3-10. Preliminary view of the Ford Motor Plant. Image 3-11. Preliminary view of a massive coal-fired power generating station, with part of the Ford Motor Plant to the left. Image 3-12. The Rearden Metal Works plant sits across the street from the power generating station in Fording. Image 3-13. Preliminary view of the grain elevators at Pincher.